In diesen wirren Zeiten ein schöner Titel für ein Buch, erschienen bei Laurence King Publishing (Ein Verlag den ich immer gerne im Auge behalte, mit vielen guten Publikationen!). Dazwischen gibt es interessante Interviews mit Neville Brody, Rudy Vanderlans (Emigre), Natalie Hunter (Airside), John Warwicker (Tomato), Angella Lorenz (Alorenz.net), Alexander Gelman (Designmaschine.com), Andy Cruz (House Industries), Kim Hiorthoy (thisisrealart.com), Peter Stemmler (quickhoney.com) und Corey Holms (Soreyholms.com). Gut in einem verständlichen englisch geschrieben, und einfach zeitgemäßer als die Weisheiten von z.B. Ogilvy (Confessions of an Advertising Man). Das Buch kommt mit sehr wenig Abbildungen aus. Druck 2c. What is the most important lesson you have learned as a graphic designer? That there´s no such thing as „graphic design“. Only lots of books on it and an assumption that it exists. And that the world likes to „commodify“. 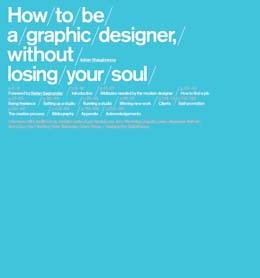 Graphic designers constantly complain that there is no career manual to guide them through the profession. Now, design consultant and writer Adrian Shaughnessy draws on the wealth of his experience to provide just such a handbook. Aimed at the independent-minded, it addresses the concerns of young designers who want to earn a living by doing expressive and meaningful work but want to avoid becoming a hired drone working on soulless projects. It offers straight-talking advice on how to establish your design career and practical suggestions – that you won’t have been taught at college – for running a successful business. Within each chapter there is inspirational guidance from a range of international designers who cite their personal mistakes and experiences as well as a chapter of one-on-one interviews with 10 leading designers including Neville Brody and John Warwicker.